Interactions between brain cells hold the key to healthy brain function and cognition, but many of those interactions are notoriously difficult to study. Now, University at Buffalo researchers and their colleagues at other institutions are publishing a paper about a new method they developed to more precisely capture how brain cells interact. The work was led by scientists at UB’s Hunter James Kelly Research Institute (HJKRI) who conduct research to better understand myelin, the fatty insulator that enables communication between nerve cells. 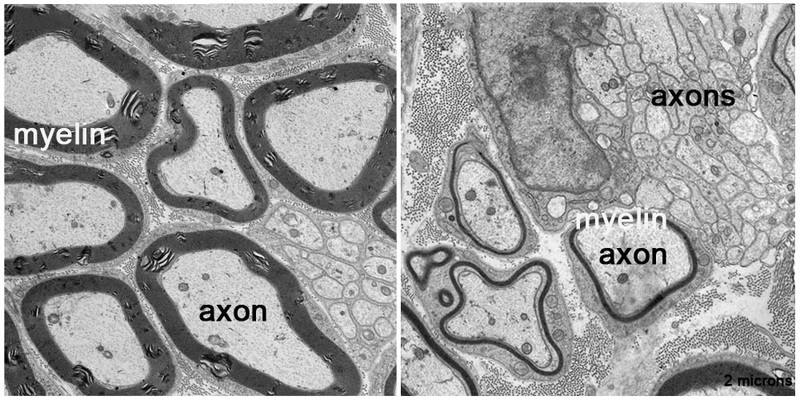 The researchers study how damage to myelin occurs, and how that damage may be repaired. The institute, part of UB’s New York State Center of Excellence in Bioinformatics and Life Sciences, was established in 1997 by Buffalo Bills Hall of Fame quarterback Jim Kelly and his wife Jill after their infant son Hunter, was diagnosed with Krabbe Leukodystrophy, an inherited fatal disorder. He died in 2005 at the age of 8. The researchers explained that cellular interactions that trigger the production of myelin are especially hard to pinpoint. That’s because the crucial point of contact between two types of cells — the connection between axons, along which nerve impulses travel, and glial cells, which support neurons – is essentially hidden. And studying this interface is critical in certain diseases, she added. The new technique for achieving this involves using the second cell (the neuron) as a trigger to attract the first cell (the glial cell). The researchers use a system with two chambers, separated by a membrane. “When the cells in the upper chamber ‘recognize’ the cells in the bottom chamber, they kind of ‘reach’ through the holes in the membrane for each other and touch. That is the intersection that we can then isolate and study,” Feltri explained. Using this technique, the researchers discovered novel proteins at that intersection called prohibitins, which, they found, are necessary for the production of myelin. The discovery will help improve the understanding of and development of new treatments for myelin diseases. It also will make it easier to study all kinds of cellular interactions, not just those in the brain. “This work has important implications for diseases of myelin such as Krabbe disease, and other neurodegenerative diseases, because the communication between glial cells and neurons is vital for neuroprotection,” she said. Yannick Poitelon, PhD, postdoctoral research scientist at HJKRI and first author of the paper, explained that glial cells support neurons metabolically and protect axons that can measure up to one meter in length, extending far away from the glial cell.